Ideal mountain-board for entry-level enthusiasts seeking value-priced. Maple laminate deck, PHT graphic material, and 46 grit aluminum oxide grip tape. Orange bushing suspension, tri-spoke hubs, knobby eight-inch tires, F1 bindings, grab handle/brake. All terrain skate trucks, F1 bindings, 8-Inch diamond tread tire, tri-spoke hub. 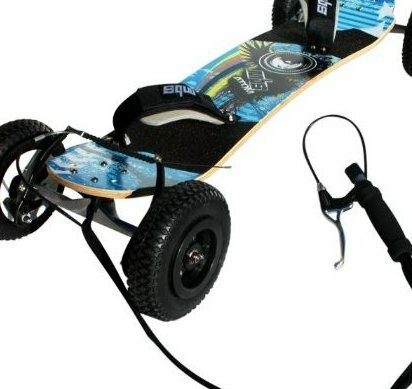 Overall Weight 15.5-Pounds, length 43.2-Inch, axle to axle length: 34.3 / 89.5-Centimeter Teen / Adult recreational mountain board.